All-silicone "silicone keyboard", compared to conventional keyboards, has lower noise level during operation, and it is an innovative product where one does not have to mind the surrounding when typing. It uses a "newly designed low key" where the height of the keys is low; therefore input can be done with a light touch and will not tire the users. The surface is finished treated with a PU process to prevent the sticking of dust and dirt, and gives a smooth and comfortable feel. The underside will not slip due to the physical property of the silicone. It has USB and PS/2 connections, and requires no installation of a driver, allowing an immediate usage from the moment of connection. It is also waterproof and heat-resistant. On top of it all, it can be compactly rolled up and carried around. It can be said that it is an idea-filled product that frees users of small notebook computers from the inconvenience of the miniature keyboard. Along with the practicality, it can be used as a gift with its wide color variation and the possibility to be wrapped in a form of a tube. After being on sales in stores, it also became popular on internet for the reason that it "tickled girl's mind". 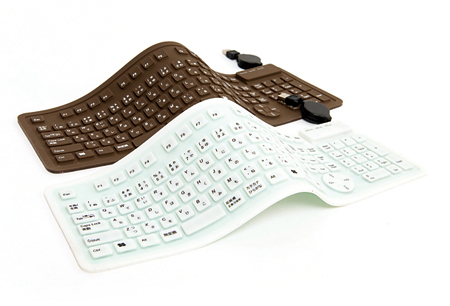 With the help of the "silicone keyboard", which symbolizes the recent trend of the transformation of OA machines into sundries, it can be said that even the kind of people who usually do not go to electronics store are starting to have interest towards peripheral devices.